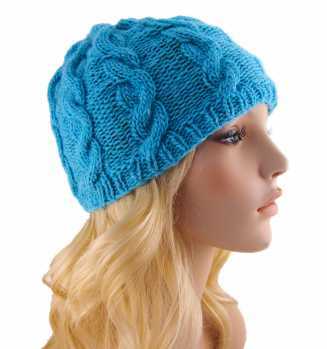 A versatile, stylish cabled hat for both men and women. Instructions are for a hat that will fit an average adult or teen head circumference of approx 20-22". Work 1x1 Ribbing for 5 rows. Work in Pattern Stitch till piece measures 7.5" from beginning. R1: *(K8, K2tog), rep * till end. R2: *(K7, K2tog), rep * till end. R3: *(K6, K2tog), rep * till end. R4: *(K5, K2tog), rep * till end. R5: *(K4, K2tog), rep * till end. R6: *(K3, K2tog), rep * till end. R7: *(K2, K2tog), rep * till end. R8: *(K1, K2tog), rep * till end. Cut yarn, leaving a tail of about 12".